If any love is false, it is a love of the devil’s bread, the mammon of iniquity versus the Bread of Life, Christ’s Body and Blood. This false charity toward Christ through satanical flattery fails to lead Christ into any disobedience of sin whatsoever toward His Heavenly Father. How much do we see the lure of this false bread of Satan today with those who preach the gospel of a full stomach to empty souls, starving for the Word of God? For example, consider Marxism’s doctrine of a full stomach, while man’s spirit literally and supernaturally starves. In the second temptation of Christ, we see the devil leading Christ to the pinnacle of the temple in Jerusalem where again Satan appeals through the flattery of false love to tempt God’s divine and human natures at once by suggesting Christ hurl Himself to the rocks below where angels of the Lord will gladly rescue him from even "dashing His foot against a stone." How this would demonstrate Christ’s almighty power! Is there a greater divine empowerment possible? Once more Satan uses his ultimate weapon of flattery of divine power to perform some perversion of Christ’s Almighty Power–throwing down and taking up His Life again to prove He is God and to amuse Satan’s whimsical false love and friendship with Christ. This is the false gift of self-empowerment, total control, even divine control over one’s life, to do whatever one pleases, desires, or wants in this world with one’s life–the doctrines of all politics today, psychology, and new-age spirituality where self-enfranchisement and self-empowerment becomes the god to worship. Satan literally mocks God’s almighty power by showing no obeisance or reverence of worship, as all creatures of the Almighty are obliged to do, but instead he tries to entangle Christ in His wicked web of flattery of divine power to deny His supreme Godhead, only to please Satan and have Him as a friend: the epitome of a false gift and a false charity. Satan, in actuality, really hastes Christ but loves himself; nevertheless, he feigns his love for Christ only for the purpose of advancing his ultimate cause: sin and damnation of all souls. It is incredible how many unwitting apostles of satanical obfuscation we have in today’s Church, advocating at will such an agenda of false charity: the self-empowerment of feminism, homosexual rights, sexual freedom and new-age spirituality. This can only be achieved by a false love and a love of self over everything else. Satan essentially paradigms the false love of self and naught else. 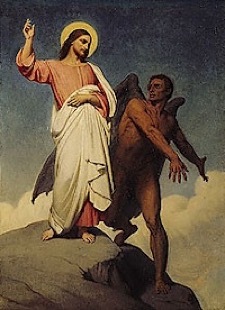 In the third temptation of Christ Satan brings Christ to some high mountains where He can see all the kingdoms of this world and their glory, which the devil promises to Christ if He will only pay homage to the devil, another gift of false charity or false love of Christ. Here Satan tempts Christ’s divinity and also a temptation to Christ’s human nature to wish to possess the things of this world which Satan claims as his own. Here Satan flatters Christ with Satan’s feigned friendship if Christ will only bow down to him and Satan will surrender all his power to Christ for this one act of homage. This, in truth, is the false gift of a false lover! This would cause Christ to submit to the ultimate false love of the universe: satanic affection. Are not many today duped into thinking a nice home, a new car, and money are proofs of God’s love for us, but homelessness and poverty are God’s curse? Finally, the powerful rejoinder of Christ reveals the only true love for anyone’s existence: "Thou shalt adore the Lord thy God, and Him alone shalt thou serve." Above all we must realize Satan uses his ultimate power play here on the divinity of Christ by feigning love or the use of false charity. Why is this the favored artifice of satanical deception? Such is the case simply because this "false charity" is so difficult to recognize and works almost every time in leading our mortal souls astray into sin! Satan dresses up sin in the garb of virtue as the master of obfuscation and it becomes a very subtle, deceptive wickedness against Christ as it is with each one of us when we fall. How the arguments of temptation are cloaked in the satanical deception of virtue in each and every instance! Such deceptive tactics of false charity fool many souls in the societal packaging of nefarious sins like homosexuality as another lifestyle or abortion as the choice a mother has the right to make for her body or women ought to be ordained priestesses because it’s simply a matter of equality and justice or everybody in every religion worships the same God so why should anyone proselytize for converts anymore. Such perverse deviations of Christ-like charity are so tragically commonplace these days. Such deception by the Father of lies is not unexpected in his temptations of Christ, for the stones of the desert, which in reality are nothing else but false perceptions and illusions of false charity, are deceptively presented to Christ as food and bread. By the same token from the mountain top, again in the naked desolation of the desert scenery, is so deceptively presented and exhibited to Christ all the possessions of the world. Finally, falling down to worship Satan is the ultimate illusion of all, the one that is so imperceptible, so clandestine, and so elusive to our everyday choices when we perform them. How easily and how often we are fooled by these diabolical machinations.